How did we get here in 2012? Greetings to the loyal supporters! Some of you may not know, but E has been an advocate for Holistic Health and Vegetarianism for over 10 years. Yes, that is absolutely correct! The love for educating and embracing the miseducation of the public has been a major charge for E. This lead to the opportunity to appear in the independent film, Soul Food Junkies. The film was written and directed by award-winning filmmaker, Byron Hurt. 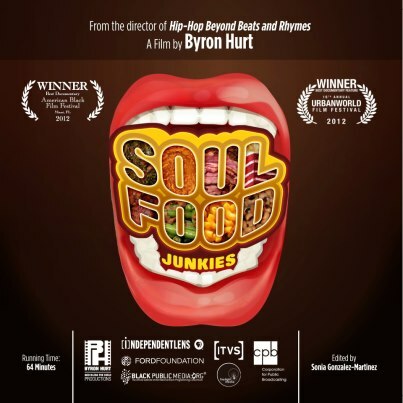 Soul Food Junkies has already garnered ‘CNN Best Documentary Award for 2012 Black American Film Festival’, ‘Best Documentary Feature at 2012 UrbanWorld Film Festival’ and featured in New York Times. The film will air on PBS, ‘Independent Lens Series’ at 10 PM on Monday, January 14, 2013. Please check your local listings.